The renowned clarinettist Martin Fröst launches the Martin Fröst Foundation this spring in his homeland Sweden, followed by launches in Beijing, Paris, New York and London later in 2019. The purpose of the foundation is to give children and young people from all over the world the opportunity to receive music education, enable access to instruments and develop the classical concert form for future generations. Buffet Crampon announces the acquisition of renowned French oboe manufacturer Rigoutat Paris, thus reinforcing its position on the double reed market. Martin Fröst and Buffet Crampon in unique and innovative partnership! 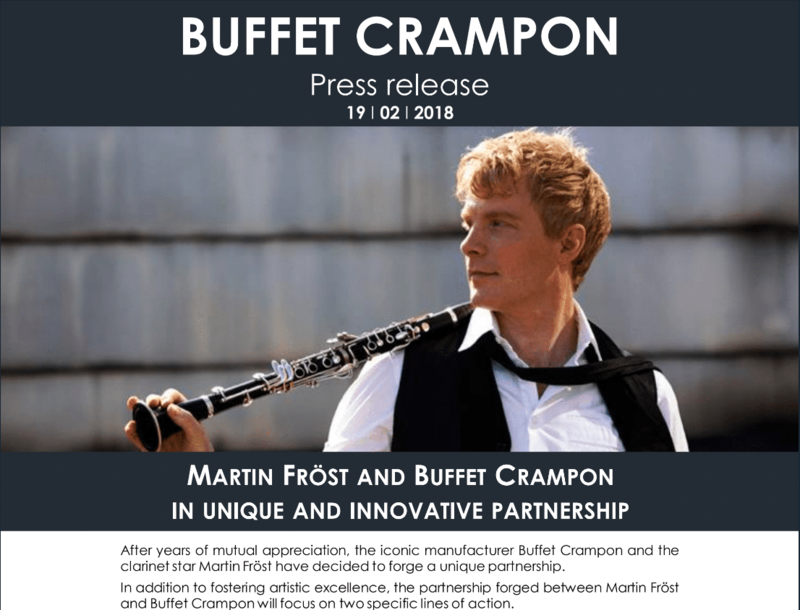 After years of mutual appreciation, the iconic manufacturer Buffet Crampon and the clarinet star Martin Fröst have decided to forge a unique partnership. Buffet Crampon launches PlayWind and becomes the first wind instrument manufacturer to partner with educators through a digital music education app for clarinet and saxophone. Buffet Crampon announces the acquisition of student brass instrument manufacturer WIND and thereby strengthens its position in China. Buffet Crampon announces the acquisition of leading US professional flute manufacturer Powell, completes full range of wind instruments.